A wistful combination of two spring-flowering branches, captured in the morning light. Aaah! 17-inch tall x 7-inch diameter cream urn. This is my go-to vase for last-minute arrangements and it is tall enough to handle the branches, which are nearly three feet long. 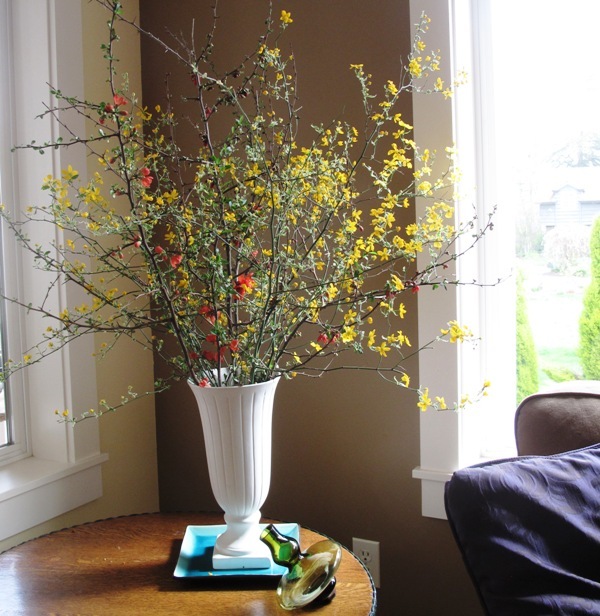 If you add cut branches to the vase when the flowers haven’t yet opened, the warmth of your home will coax them into flowering indoors. . . for up to two weeks. Jump-start spring: Many flowering shrubs and trees are suitable for indoor forcing. 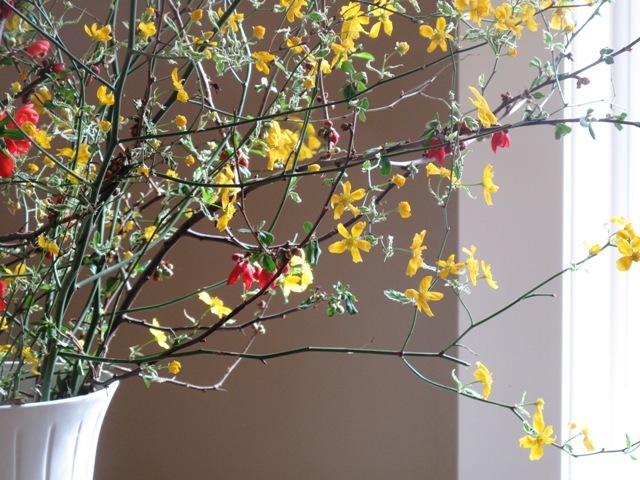 In addition to Kerria and quince, you can cut the bare branches of forsythia, witch hazel and numerous fruit trees. Harvest branches when their buds begin to swell, taking care to use proper pruning techniques. Re-cut the stems on a 45-degree angle and place them in a vase of clean water. Over time, the buds will respond to your home’s warmer temperature and begin to flower. Be sure to change the water as you would with any floral arrangement. NOTE: Each Sunday of this year, I will post my photographs, “recipe” and tip for that week’s floral arrangement, created for my new book, Slow Flowers. This entry was posted on Sunday, March 31st, 2013 at 6:46 am	and is filed under Creativity, floral design, Gardening, General, Landscape Design, Plants, Slow Flowers: 52 Weeks, Writing. You can follow any responses to this entry through the RSS 2.0 feed. You can leave a response, or trackback from your own site.